China got its start in the Yellow River Valley but grew in isolation due to barriers like the Himalayas and long distances that separated it from others. The Zhou [pronounced: Joe] Dynasty took control in 1122 BC and ruled for 900 years. Zhou rulers claimed to govern with approval from the gods. Under this "Mandate from Heaven", the king had to follow the "Way", or Tao, which was part of the philosophy of Taoism. The emperor was expected to rule in a way that pleased the gods. If trouble developed, people could justify his overthrow. The Qin [pronounced: Chin] Dynasty followed the Zhou. Emperor Qin Shi Huangdi [pictured above] used strict laws to keep people in line. 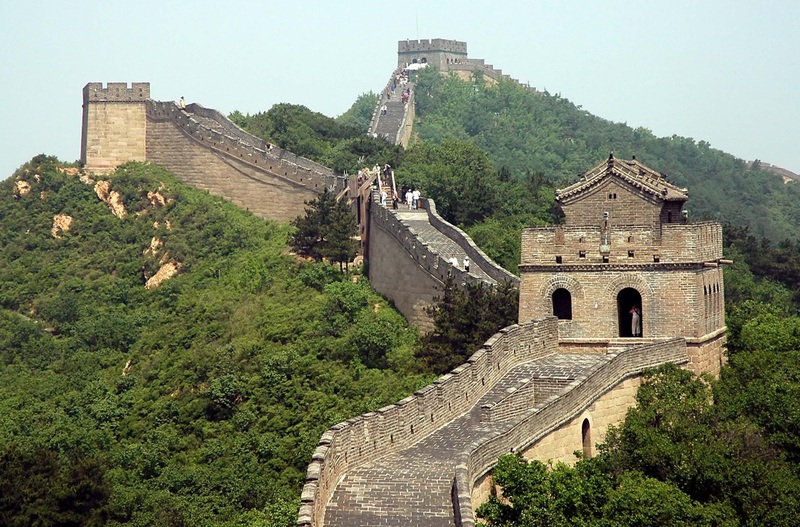 In 221 BC, he started building the Great Wall. He even built an underground tomb with over 6,000 life-size terra-cotta soldiers (modeled after real ones) for eternal protection [pictured below]. 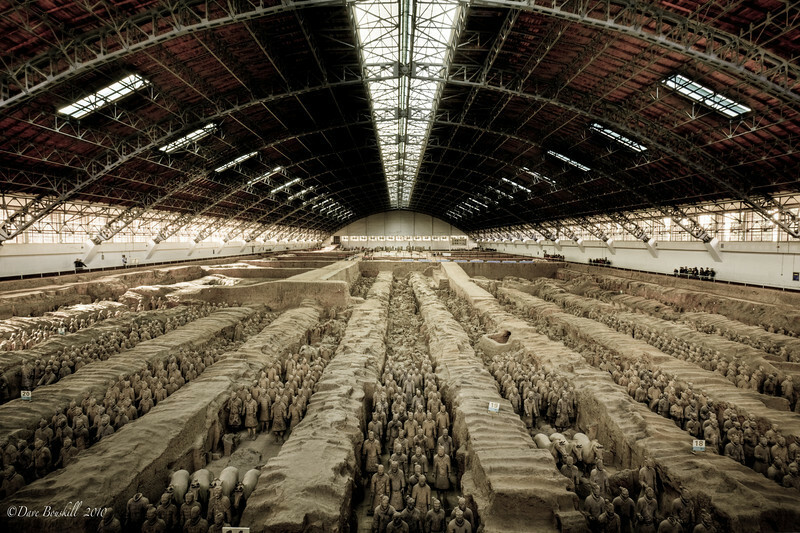 The terra-cotta army was uncovered accidentally in 1974... by a farmer digging a well. The Han Dynasty took over after Huangdi's death. Trade along the Silk Road, which stretched 4,000 miles to Rome, increased demand for Chinese silk and spices. The Han's 400-year reign was so successful that the Chinese still call themselves the "Han People". Chinese tradition dates their beginning to the five Heavenly Emperors who were succeeded by the human rulers of the Xia Dynasty (2357-2256 BC). 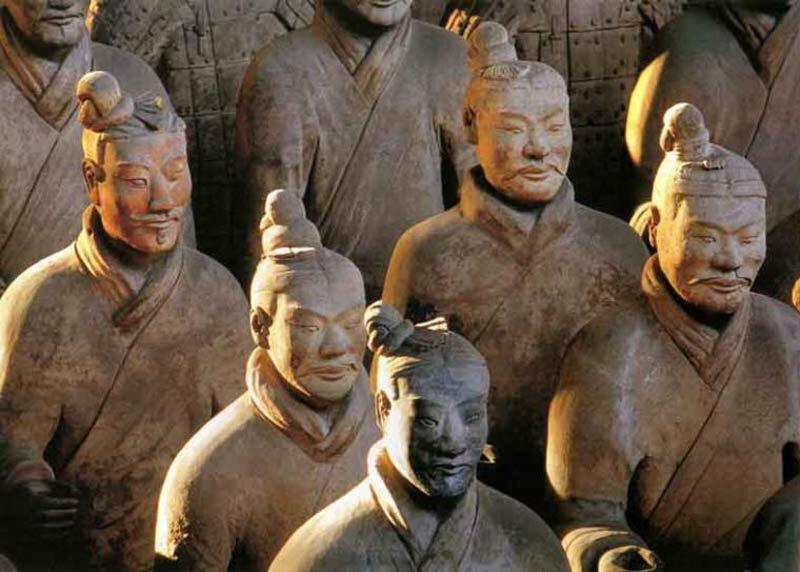 Little evidence of the Xia exists, so scholars begin with the Shang Dynasty (1750-1122 BC). 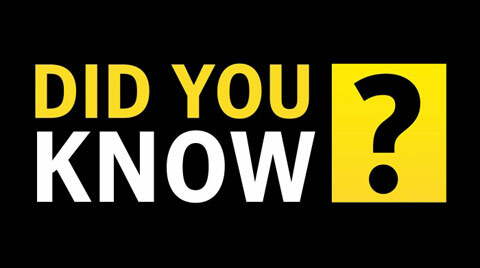 In other words, China has had plagues that lasted longer than the U.S. has been a country! Huangdi hired "doubles" to walk around and confuse would-be assassins. Hoping to live forever, he experimented with many potions... until he poisoned himself in 208 BC. Idiot. The Great Wall that we see today was not built until the Ming Dynasty (1368-1644 AD), although Huangdi did start it in 221 BC. Its purpose was not to keep people out but to keep those who got in from getting out with stolen property. Working until 1620 AD, and with thousands dying along the way (FYI: their bodies were just buried within the wall), the wall averaged 20-50 feet tall, 15-30 feet thick, and was 6,300 miles long. While it cannot be seen from space with the naked eye, it can be seen in low-orbit with a telescope.